Nokia Lumia 525 will be the latest windows phone 8 with Lumia black update.Nokia Lumia 525 Price in Inida will be a little more than Lumia 520 which remains Nokia’s best seller among Budget windows smartphones.While comparing Nokia Lumia 525 with Lumia 520 the difference are few like 1GB RAM upgrade ,8 GB inbult storage ..etc. 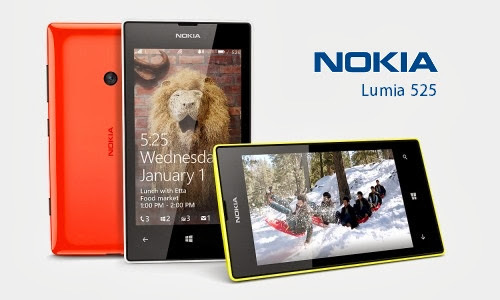 Hope Nokia will keep the Price of Lumia 525 under budget category. Nokia Lumia 525 specifications includes a 4 inch large WVGA IPS LCD display of 480×800 pixels.1GHz dual-core Qualcomm Snapdragon S4 processor will perform well with 1GB RAM which lacks in previous model Nokia Lumia 520.Read further for much more features and Detailed specifications. Nokia Lumia 525 comes with Pre loaded social networking apps like WhatsApp,Facebook,Twitter,Skype ..etc. Nokia Lumia 525 also features popular location and GPS navigation apps like HERE Maps, HERE Drive, and HERE Transit.You could download many more free Games and Apps for Nokia Lumia 525 from windows phone store. Available colors are Black, White, Yellow and Red.Hard cases ,Flip covers and Screen guards will be available soon. Nokia Lumia 525 Price in India is Rupees 9100 . Check out online offers and Discount coupons to get lowest price on various Online shopping websites.